← Parma Number 36: Caxton Hotel … Not worth missing cricket training for! The Verdict: The most impressive thing about the Jubilee Hotel’s chicken parmigiana is the price. At $11 that price can not be beaten. That said though, from the dry over cooked chicken through to the almost non-existent cheese, this chicken parmigiana did not otherwise impress. Chicken: The photo above speaks for itself. The chicken piece was on the small side and had been very over cooked. That left the outer shell of the chicken extremely crispy and the chicken quite dry. Tomato Sauce: The fact that there was not enough of the tomato sauce to cover the chicken piece, this element of the Jubilee Hotel Parma was the hero of the dish. It tastes great. Ham: If the ham had not been over cooked and therefore was all curled up on the chicken piece it would have covered it. Unfortunately the ham was rendered a bit tasteless by it’s over cooking. Cheese: Where was the cheese? This is a rhetorical question obviously, however it is reflective of what I was thinking when this meal came out because there was just not enough of it! Side dishes: Where the chicken piece was quite over cooked, the chips were under cooked in places. Whilst the vast majority were well cooked and well seasoned there were too many cold chips also thrown in. The salad was a fairly plain garden salad with limited dressing. Presentation: As this was a fairly small piece of chicken one might have expected the elements of this dish to be separated on the plate. Alas, the chicken found its way onto the chips and some of the salad again. The Venue: The Jubilee Hotel, on St Paul’s Terrace in the Valley, is an inner city institution. The hotel is recently refurbished and has a massive open air area out the back. A large TAB facility is available, unusually for most inner city pubs. My Parma, part of a special when you buy a drink over the bar, cost $11. The Final Word: I have made much of the price of this chicken Parma and that is because it, the price, was the highlight of the dish. The fact is what was served at Jubilee is what I would expect for an $11 meal. The fact also is though that this was not Brisbane’s Best Parma. 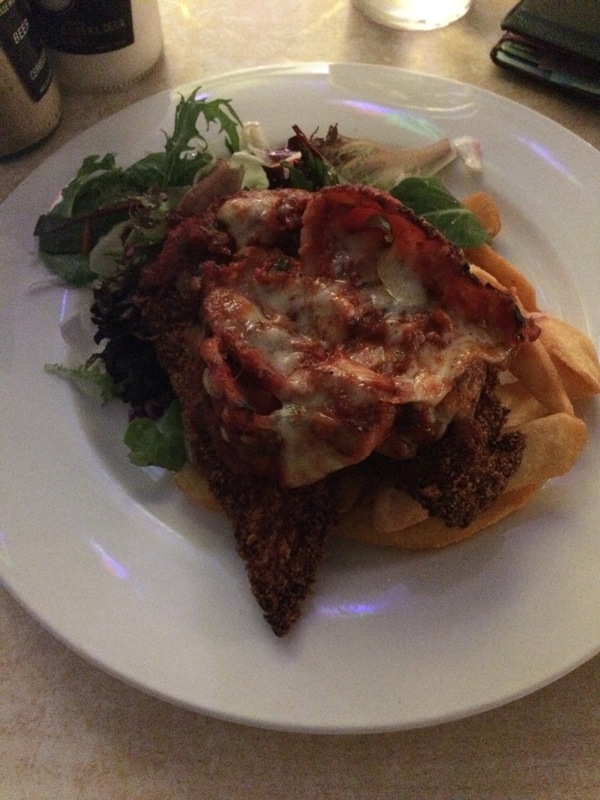 This entry was posted in Uncategorized and tagged brisbane food, brisbane's best parma, chicken, chicken parmigiana, jubilee hotel. Bookmark the permalink.